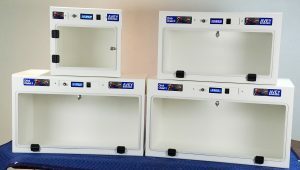 Fantastic Brooders for raising baby parrots and baby macaws. Time tested design (since 1998), All the features you need. Rugged and reliable. Built to last for many years. One year part and labor warranty. 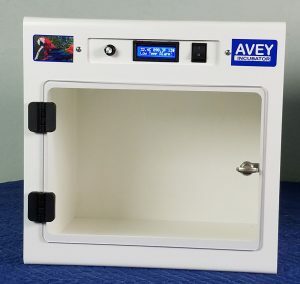 The Chick Chalet 3 nursery brooder from Avey Incubator. 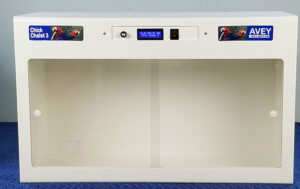 Quality rugged cabinet and clear polycarbonate door. True digital controls. So easy to use, easy to clean. Precise. optional digital humidity control, High/low alarms, Direct entry of temperature and humidity (optional) setpoints. Passcode protection. Celsius and Fahrenheit readout on the alpha-numeric display. Easy to maintain, with built in extra features to head off mistakes before they happen. The Chick Chalet 3 series features an improved rugged hinged door with a quarter turn latch. The large size (32″) is great for multiple clutches – plenty of room inside to work with, place separate baskets of your choice with a clutch of new babies. The Extra large size (34″) although still perfect for multiple clutches of baby parrots is big enough to accommodate the largest rehabilitating macaw with their tail too. Even our smallest size (17″) is a safe environment for a new clutch and for many decades was the standard size for parrot brooders. The hinged door on the Chick Chalet 3 smoothly swings out of the way, and allows you place units side by side. 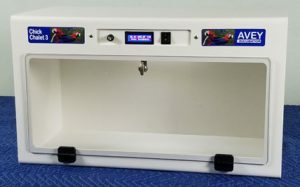 The door, constructed of rugged polycarbonate, you can easily open and close the door with one hand while removing the baby parrot when it’s time for feeding with the other. This is the main brooder status screen showing the temperature. Microprocessor controlled (Just like our other products). To change the temperature setpoint you must first enter a passcode (number) Dial in the passcode, 5, (so no accidental changes in the settings). Then you may change the temp up or down in tenths of a degree C. then set the temperature you desire on the “adjust temperature” screen and then the unit heats to that temperature and holds there. Easy and precise temperature adjustments. 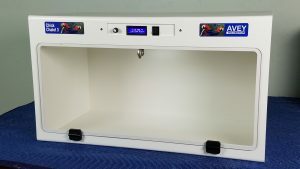 Digital Humidity Control (DHC) allows you to control the humidity to a greater degree of precision. What you get: A humidity readout on the display screen, an additional menu screen that allows you to set the humidity between 20%RH and 70%RH. And an external humidifier that we use as a water source. 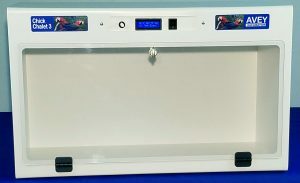 The advanced electronics turn the humidifier on and off to regulate the humidity at your desired setpoint. Do you need this extra precision of humidity control? Most nearly everyone does not. But some rain forest birds (Toucans) and people living in very dry climates might opt for this.